There is no doubt in my mind on the importance of the “default”, two-handed, high pectoral, linear draw stroke. I have spent tens of thousands of hours on this skill…..with every minute being well worth the time. As I have progressed in my skill sets and knowledge base, I have also seen the importance of something more well-rounded and completely versatile. In my observations of dash camera video, lethal encounters, FOF encounters, and my experience on the streets it has always been clear to me that people may not always be able to get to their default draw stroke. As a matter of fact, that it may be a very bad idea trying to use the default draw stroke in many situations. The reason for this is that there is a need to square up to the threat. By squaring up you may have had to adjust the direction of your movement and stopped to plant yourself on the X or in the kill zone. In a reactive situation, adjusting or stopping the direction of your movement could be a very bad idea. Your displacement off of the line of attack is negatively affected by this adjustment for squaring up. It is my opinion that accepting your momentum and continuing in the general direction of your movement, possibly in an explosive manner, and then drawing directly to the threat is a much more efficient and effective tactic. This is very much like drawing directly to the threat while seated in a car. We all know that this will cover our legs, but in a truly life threatening reactive situation, your body will choose the fastest way to align your firearm onto the threat. The very same concept should be applied to your draw stroke and the corresponding direction of movement while we engage. It is my opinion that a completely versatile draw stroke should be added to a well ingrained default draw stroke. One should be able to draw directly to the threat no matter what “clock position” the adversary is at, without squaring up, or dramatically adjusting the direction of your movement. As we break away from the slavery of the default draw stroke, we begin to see the absolute need for a well refined one-handed draw stroke. My two-handed draw stroke (right-handed) covers my 6:00 (think modified grip from last chapter) all the way around to my approximate 2:00. My one-handed draw stroke covers the rest. That is eight positions on the clock two-handed and four positions on the clock one-handed, which is very significant and relatively closed to being of equal importance. As we add the completely versatile draw stroke, we will immediately see the benefits to this in regards to getting off of the X, especially in a dynamic fashion. The fastest way possible to get off the X is by exploding forward, the general direction that the toes are pointed (from the 10:00 to the 2:00.) If you have “walked” into a bad situation, this is even more obvious. The continuation of your forward movement makes the explosive move out of the kill zone even more effective and efficient. To not use that momentum to your advantage could be a very bad idea. As I have said before, the height and the extension of the gun will depend on a number of factors, proximity of the threat, urgency of the shot, position in the reactionary curve, need for retention properties, chaos of the encounter, type of terrain/obstacles, user’s skill level, and tactical considerations. The completely versatile draw stroke also takes in the consideration of these factors. Not only should you be able to engage to every position on the clock, you should be able to do it throughout the various levels of extension of your completely versatile draw stroke….one handed and two. You have all seen me preach about “being able to make solid hits, from any position, from any angle, anywhere throughout your draw stroke, with what ever movement that is necessary.” The completely versatile draw stroke is a significant part of that concept. And from what I have seen in during my observations…. a very important part of that concept. 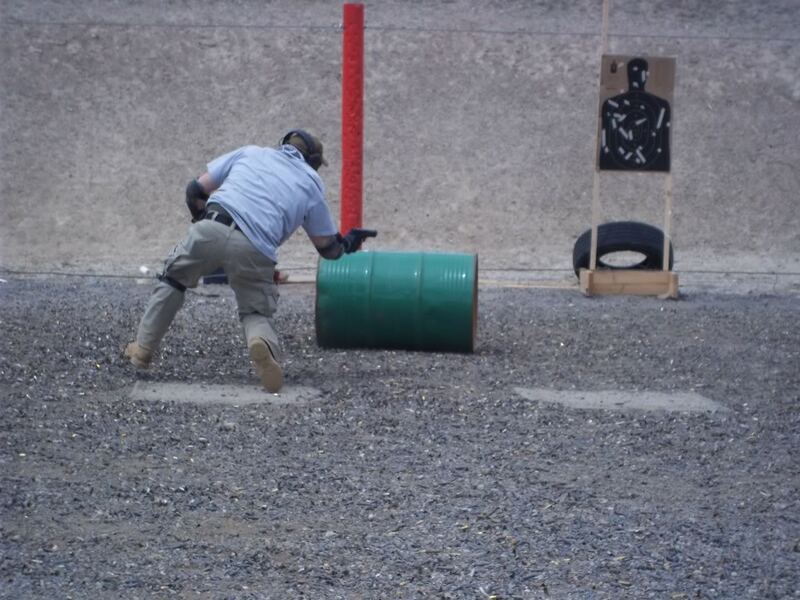 The completely versatile draw stroke is just one part of the “Dynamic Movement Draw Stroke.” While working with the concept of “drawing directly to the threat,” it is nice to notice that the square range training of the concept, for purely safety reasons, is actually the best way to do it in the real world. That fact does not happen very often, but it does so here. As we look at drawing directly to the threat on a firing line, we need to understand that “directly” cuts out any sort of swinging of the arm horizontally that may cover somebody that is on the firing line or outside of the direct path to the targeted area. What we do and what is best for the square range and the real world is draw directly to the threat in a direct horizontal and linear manner. If we look at drawing directly to your 9:00, that means that the gun is pointed at the ground as it comes out of the holster and across your body. It is then rotated vertically to the 9:00 and then driven horizontally out in a linear manner. The orientation of the gun is never off of the 9:00 path and that path is from the area around your feet and directly up/out to the threat. With dynamic movement this may cover your legs, but they are covered whenever you come in or out of the holster. That is the reality of the situation whenever you draw directly to the threat (especially with dynamic movement and when you are seated.) Have solidly ingrained trigger finger discipline and it will not be an issue. So, we obviously see that this is very good on the firing line. The question is why is it good in the real world? Horizontal swinging of a firearm under stress is always a risky maneuver. Under stress and during an adrenaline dump you have the obvious risk of over travel past your intended targeted area. You also have the problem with the “tuning fork” effect as you try to stop the momentum of your swing. If we use our completely versatile draw stroke in the same “linear” manner as our default draw stroke, we are much more likely to hit what we are aiming at. Draw directly to the threat using straight lines, drive the gun directly to the threat on those same straight line, all while using a perfect balance of speed and control. Back in 2005, when I first started teaching dynamic movement to every direction on the clock, I would often witness the same thing over and over again, within a certain cross-section of the students. We would be moving to the right rearward oblique (the 5:00) and the right-handed students would inevitable end up in a back pedal. It was odd, I simply could not figure out why they kept doing it, and no matter how many times I would demo it easily and successfully, they would still end up back peddling. I was teaching a course in Georgia and a very squared away student and friend was running the drill and he kept back peddling. Since he was also an Instructor, I felt as if this was the point that I had to figure out why this phenomenon kept happening. I had him run it over and over again trying to see what he was doing. Finally, it dawned on me that I was analyzing the wrong person. The correct question is not “what is he doing?” The correct question is “what am I doing that he is not doing?” So, I had the class gather around to analyze what I was doing. As so as I put the training gun in my hands to walk through the drill, it dawned on me like a bolt of lightning. There I was staring at this grip on my handgun that I had never even realized that I was using. Here we were, thinking the back peddling problem was a footwork problem and all along it was a grip problem. Finally, I figured out what the difference between what I was doing and what they were doing. I tend to be very fluid, I accept very few hard rules, and I am very comfortable just doing whatever needs to be done to get the job done. Within this fluidity, I found that I would alter my grip on the gun to relieve tension in my body. By relieving this tension, I never felt the need to unwind from it and back pedal. I found that the students that were having a problem with back peddling did not know that they could alter their grip. They had one grip and they were slaves to that one grip. This left them in a position where they had no choice but to unwind the body and back peddle inside of the designed drill. As soon as I figured out the problem I started looking at what I was doing. I was adjusting the support side hand into a Center Axis Relock (CAR) like grip. I had never been trained in CAR. but I had seen demos on the internet before. As soon as I diagnosed the problem and began teaching this modified grip, the back peddling went away. This epiphany came out of no where in Georgia and is now a permanent part of the curriculum. I also teach it as a “defense against car jacking grip” from the driver’s seat to the 9:00 through the 7:00. Do not be a slave to your grip. You can make the hits with some pretty major adjustments on the support side hand. 1) Unload your handgun and verify unloaded. 2) For a right-handed shooter, point in to your 12:00 with a standard two-handed grip. 3) Now with as little pivot of the feet or the waist as possible slowly start bringing the gun around counter clock wise towards the 7:00. 4) Keep you support side hand fluid and let it slip around the firing side fingers that are on the front strap. 5) As you do this, the gun will continually move close and closer to your face, until you are in a full CAR like modified grip, with the gun about six inches from your face, pointed in at your 7:00. I have spoken often about the genius of the old timers combat crouch. The more that I work with movement, the more that I realize that everything that I do with movement is based on the concept of the combat crouch. The combat crouch is nothing more than an athletic based, movement platform. The exact same concept as the dynamic movement platform, the controlled movement platform (the Groucho,) directional changes (cutbacks,) and a dynamic movement take off. I have still photos of me doing all of these techniques……..they all look just like the combat crouch. This is one fluid concept, not a number of different techniques. It is so simple that a caveman can do it. The whole concept is based on acquiring a lowered base and an athletic movement based platform out of a neutral standing position or neutral walking platform. The dropping of the hind quarters (lowered base), the bending of the knees, and the pointing the toes the direction that we are headed are all things that the worlds best athletes do to facilitate dynamic movement. This lowered base also works within our physiological desire to make ourselves a smaller target when incoming fire is part of the equation. As I look at my reality, in an effort to proceed through life, it is plain to see that I will most likely be responding from a neutral walking platform. The ability to see trouble, as I am in my neutral walking platform, and to have the ability to instantaneously drop into an athletic platform, out of nothing more than a startled response, and to explode off of the X, is an an essential skill set to own. This move is the exact same move that we see in controlled movement, dynamic movement, and directional change. All of it is the exact same concept! Just as we see in athletic event after athletic event. There are many factors to consider when you look at the best direction to go for any specific situation. As you can see, setting any limitations on the direction that you train to move could be a very bad idea. We need to train in all directions, all while using our prioritization. As for a common sense prioritization, Fight Focused Concept (FFC) really prefers the movement toward the forward oblique’s (10:30 and 1:30.) This gives us the very most angular displacement that we are giving our adversary to deal with, which makes it harder for the adversary to hit us, while giving us a direction that makes it very easy for us to make the hits on them. Another priority direction that has been brought back from the combat proven skill sets of the “old timers” is aggressively advancing (12:00.) This direction has a very long history of success. These successes are being rediscovered now that we are back at war. This direction really gets inside of the adversary’s head, it messes with his OODA loop, and often puts him in a panic mode. This all comes down to doing the unexpected and the application of increasing pressure. 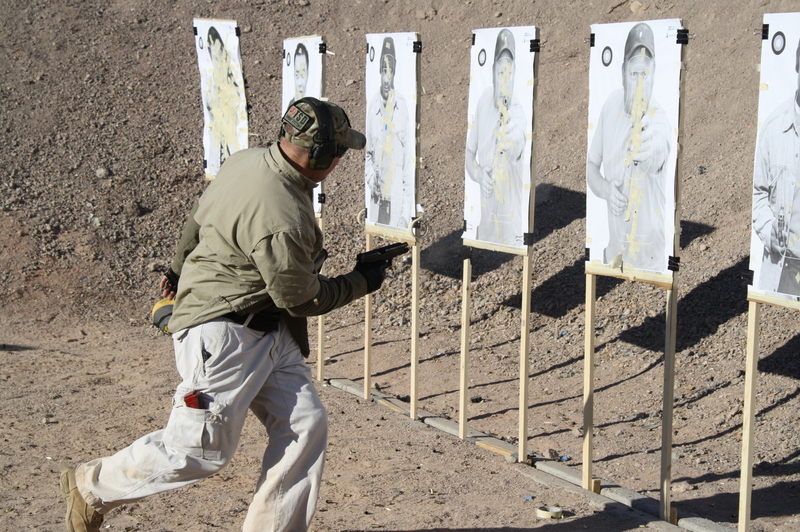 Most of the forward movement skill sets give us the ability to perform the “increasingly accurate marksmanship” phenomenon, as we close the distance. Rearward oblique movement (4:30 and 7:30) is a slightly lower priority direction, yet is still an essential skill set, especially against edge and blunt weapons. Rearward oblique movement can be a very dynamic as long as you get your hips around and point your toes (as much as is comfortable) the direction that you are headed. Back peddling is something that you should try to mitigate as much as possible, when it is up close and down and dirty. Back peddling is slow and does not facilitate the use of directional changes as well as “turret of the tank” concepts. Back peddling can take on a more prevalent role when the immediate threat is low and the distance and the difficulty of the shot demands a more stable/squared up shooting platform. Quality rearward movement skills are dependent on quality one-handed shooting skills or the knowledge to never become a slave to your two-handed grip through the use of a modified grip. You must be fluid with your two-handed grip while moving rearward, towards your 4:30 (if you are right-handed). Lateral movement (9:00 and 3:00) is a decent direction and needs to be trained. But, we must remember that the angular displacement is not of the comparable degree as the forward obliques. It also does not give us the “increasingly accurate marksmanship” phenomenon. This direction of movement is much more about being able to fight to cover or the exit of the fight. As the “which way do I go” questions get answered, one more question that is always bound to be asked. “Which direction makes it harder for the adversary to track me?” The common answer is that moving to the back side of his gun hand, makes it harder for him to track you. I am of the mind that I do not know for sure……nor do I care what the adversary is capable of. All I know…..or care about is what I am capable of. My goal is to make the adversary fight my fight, to leave him in the position where he is responding to my strengths…..not me guessing about his strengths. If I am working the forward oblique’s and the distance leads to a retention problem, I am going to my right. The cross body aiming of my modified grip, out of moving to my right gives me excellent retention properties. If I have some distance while working the same forward oblique’s, I going to move to my left. The visual input out of the “point shoulder” aiming method is something that my body just loves. I know that I am fast and accurate and the solid body mechanics facilitates extreme dynamic movement. I am going to work with what is known, as fact. I am not going to guess what someone else is capable of. I want to make them fight my fight. The bottom line is that it is a very good idea to “train for the worst and hope for the best.” You never know what the dynamics of the fight are going to be. It is the wise man who trains himself to be well-rounded as possible in order to cover as many bases as he can. Training in just one response will make you a “flat sided” fighter. Flat sided fighters can not adapt to varying tactics, if you can not adapt, you will not overcome. But, to the very same degree, movement must have purpose. Moving for the sake of moving is not wise at all. 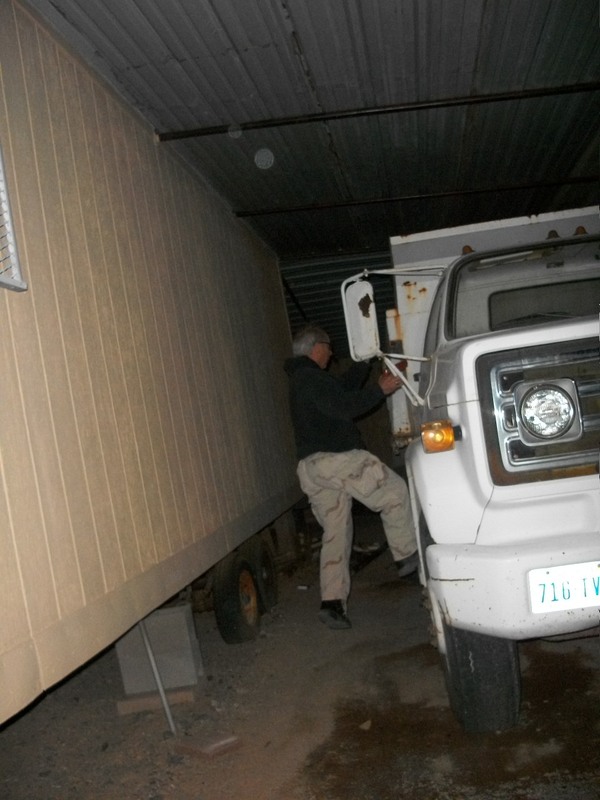 Movement must give you a tactical advantage. If you can dominant the encounter with fast and accurate stand and deliver skills, then that may just be the very best way to go. If you can not hit the targeted area, just about as well with one hand as you can with two, this weakness will cause severe limitations inside of your dynamic movement skill set. It is my opinion that there is no better way in the world to bring your one-handed skill sets up to a very high level, in a very short amount of time, than the study of the Fairbairn, Sykes, and Applegate point shooting methods. I consider these methods far superior to anything else that I have ever seen, due to the fact that many of my students spend only a half of a day on the skill set, and they are able to reach skill levels that begin to rival their two-handed skill levels. This is a missing link that so many do not have when they try to judge shooting one-handed with dynamic movement. Without the knowledge and the skills the phrase “you cannot get there from here” rings true more often than not. If you have good one-handed skills, these skills really shine inside the “dynamic” portion of the movement continuum. On the counter balance and stabilizing force, this is the same principle as the way a Cougar uses its tail when it is moving dynamically. 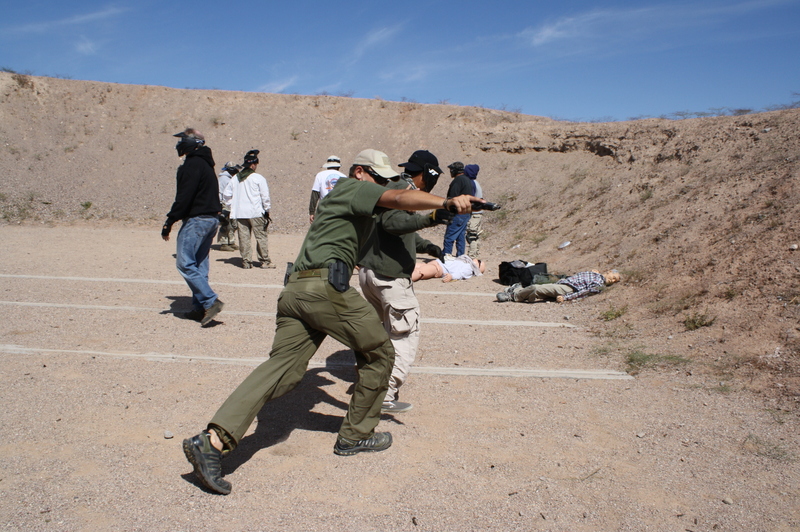 The support side arm is used in a natural manner to counter balance the extended handgun. It also stabilizes the handgun from the rolling of the shoulders and the slight twisting of the body, that you get while you are running. It also mitigates the bouncing that comes from the impact of the feet hitting the ground. 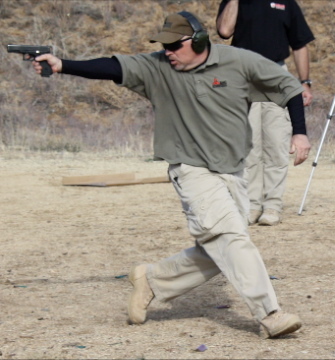 The use of the support side arm in this manner helps facilitate a more “consistent index” during your dynamic movement by “floating” the handgun. At logical distances this consistent index is so reliable that you can work the trigger as fast as you can with no need to verify that you are indexed on target in between your shots, with sight verification. This is very helpful when you are behind in the reactionary curve and are fighting to take back the lost initiative. One handed skills are a must for those that want to be well-rounded and versatile. Do not limit yourself to just using this very important asset, for nothing more than supporting a firing position. When you are working to accomplish something that nearly everyone else believes to be impossible, it may be best to start with a clean slate. Forget about your preconceived notions, the status quo, and clear everything off of the table, so you can start to build from the newest of foundations. Anytime that you have two hands on the gun while you are moving dynamically, the body mechanics of this will make the handgun bounce more and move side to side more….like a big infinity symbol. With one hand, the gun can “float” better due to not being tied together at the end and there is 50% less negative shock input coming from the two separate sides of the body. You will be able to index on to the targeted area in a much more reliable fashion. The added benefit of the support side arm working as counter balance and stabilizer is another huge asset that must be identified. You will see that your handgun may have significantly less movement across the targeted area. So much so, that you are consistently indexed on to the targeted area at logical distances, all while running. This consistent index moves you past the point where you need to slow down your movement or seek constant sight alignment verification. You can now work the trigger at a speed that is relative to the distance and you will make the hits at those logical distances. The five elements are as follows. (1) Absolute confidence in your point shooting skills. You must have solid point shooting skills down to a subconsciously competent level. (2) One handed shooting skills that rival your two-handed shooting skills. You must be able to shoot very well one-handed. Two handed shooting on the run is not nearly as effective or efficient as one-handed shooting in many circumstances. This is something that is easily proven with the test above. (4) Elimination of negative visual input. The gun should not be in your line of sight. You should not be able to see the sight alignment. You should only be able to verify that you are indexed on to the targeted area by looking over the top and aligning down of the top of the slide. 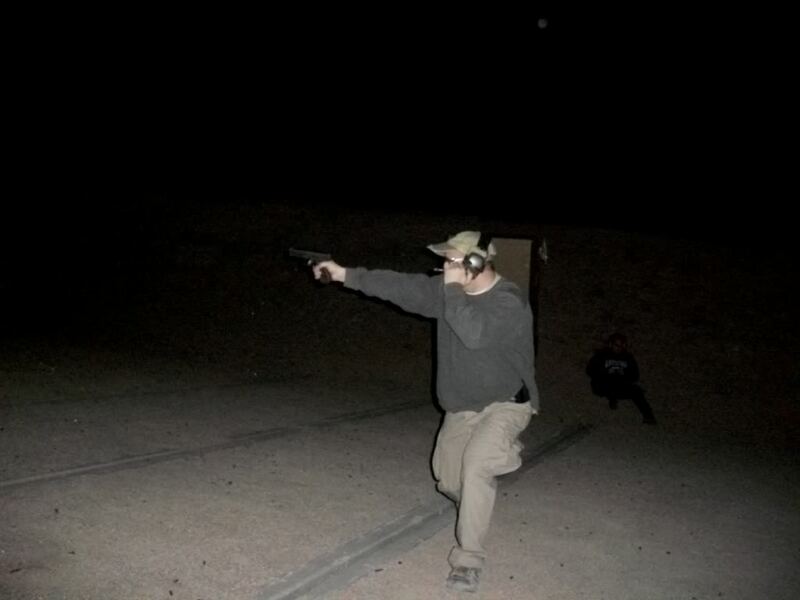 Having the negative visual input of the gun moving in front of your eyes will slow down your speed on the trigger, your speed of movement and make you hesitate. You need to trust your point shooting skills and know that you are consistently indexed and work that trigger as fast as the situation will allow. (5) The ability to use the support side hand and arm in a natural manner to stabilize the firing side hand. 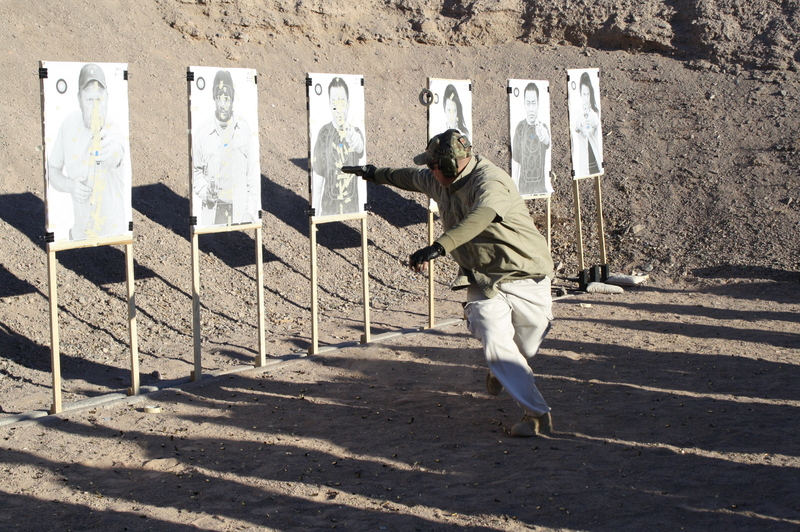 The support side arm swinging in a manner that counter balances and stabilizes the handgun is a very natural ability. 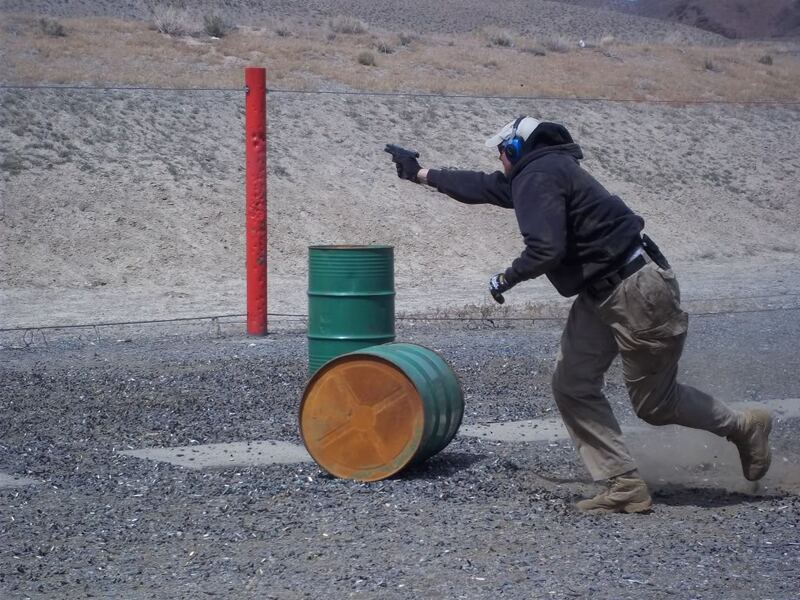 Concentrate on stabilizing the handgun, understand that your support side arm is a key factor in that regard, and do as Brian Enos says “Pay attention and your body will figure it out.” This works very much the same way that a cougar uses its tail to stabilize and counter balance its dynamic movement. Same exact concept! These are the five concepts that I teach inside of all of my Point Shooting Concepts courses. The application of these concepts, over the last nine years, has allowed my student base to do what most people believe to be impossible.